The roof structure is difficult to reach, even on a one story home. It can be impossible for a commercial building. As Hingham commercial and residential roof cleaning pros, we have the tools and techniques to reach any area during pressure washing. We specialize in exterior cleaning including roofs, siding, fences, decks, sidewalks, entryways, and more. Sprucing up your home or business doesn't have to be hard, just call us. A to Z Softwash offers all types of exterior pressure washing. Our Cape Cod roof cleaning experts also clean commercial grease hoods in Hingham. If your home is covered with those green stains from algae, brown from mildew, or red rust streaks, it's time for house washing. You can handle the job yourself or make it easy by hiring a pressure washing service. If you want help, we are ready to get to work. As a full-service exterior cleaning company, we can clean your home from top to bottom. Tile can be very durable, but it is porous. So is grout. This means it can hold onto ground-in grime. If you have tile on your roof, patios, or entry ways, we can get it deep down clean. There will be a remarkable improvement in the luster and beauty of the tile work. If you have a commercial kitchen, the grease hood will need to be cleaned. This is important to avoid the buildup of flammable grease. In fact, businesses are required to keep them clean to stay in compliance with local and national health and fire safety codes. 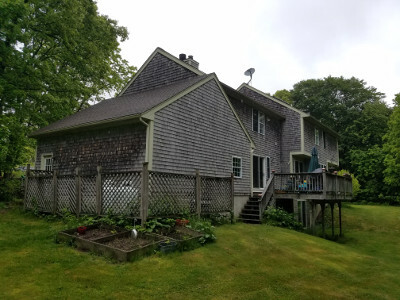 If you are looking for a reliable Hingham, MA roof cleaning or pressure washing professional, please call 508-209-7795 or complete our online request form.